Scott thought this was a great idea! We signed up for a day trip from Gibraltar to Morocco. We would catch a ferry in Algeciras, Spain, cross the seven miles to Africa, go through passport control in Ceuta and then take a bus to Tetouan, Morocco. We had to turn over our passport in Ceuta, which was a little nerve-wracking. They would keep our passport until we returned that afternoon. On the way to Tetouan we stopped at a roadside vendor that offered camel rides. I was thrilled as I had never seen a camel up close. I was wearing shorts but put my sweat pants on as I expected an adventure ride through the desert scrub brush. Instead, the camel-herder had the camel kneel down, and then I climbed on. He warned me to hang on tight, which was great advice as the camel started to stand by raising its back legs first. I pitched forward and was looking directly down at the ground. If I had not had a death-grip on the saddle I would have pitched off onto my face. Scott was trying not to laugh himself silly as he watched the event. The camel stood up on its front legs and I was finally upright on a camel – amazing! It was great fun, until I found out that the ride was 20 feet – basically the camel was lead in a small circle, then kneeled again and I climbed off. Disappointed at the duration but thrilled at the interaction, Scott and I climbed back on the bus and we headed for Tetouan. We saw the market and square in Tetouan – I will post pictures shortly. The sites were outstanding – very colorful, delightful spice scents in the air. The guide took us to lunch, which was delicious. During lunch, we were warned by other travelers that the guide would take us to rug vendors and put a hard sell on us to try and get us to buy rugs. I had thought of putting some rugs on the Catana to help protect the cabin sole, but wanted to make certain they were durable and would not create a tripping/slipping hazard. So I was open to the rug experience. We were also told that they would split us up to keep partners from helping each other resist the high-pressure sales tactics. We were fortunate that we chatted with these experienced travelers, as their tips proved accurate. Scott was taken to one shop, where he caved and bought rugs that he had shipped home. I looked at the rugs, but none seemed to fit my purpose – they were emphasizing enormous rugs for living rooms. I had moved into a townhome in preparation for my circumnavigation, so the last thing I needed (or had room for) was a 20 foot rug. I looked at the runners and many were beautiful, but none seemed like they would work well on my boat. So I started saying “no thank you”. This went on for a couple of hours and ended up being really aggravating – I wanted to get out and see more of the city. The sales experience finally ended and we reconvened. 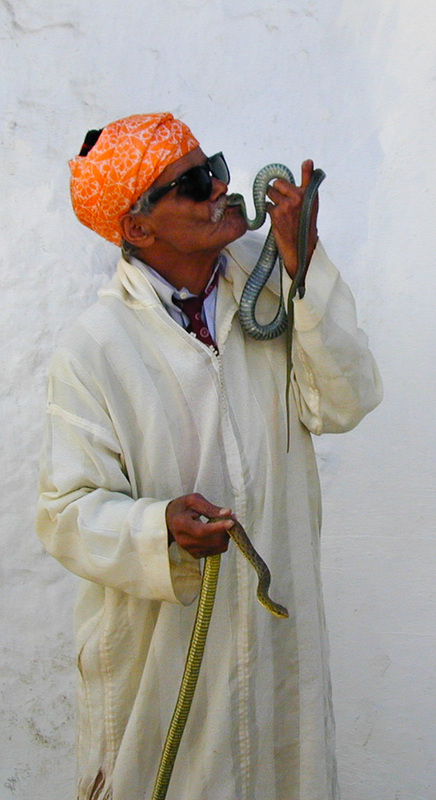 As we walked through the square, we stopped to watch a local snake-charmer. Completely amazed – we watched him kiss the snake, pick them up and handle them, and ask the crowd if they wanted to interact with the snakes. The kids screamed, and Scott volunteered. 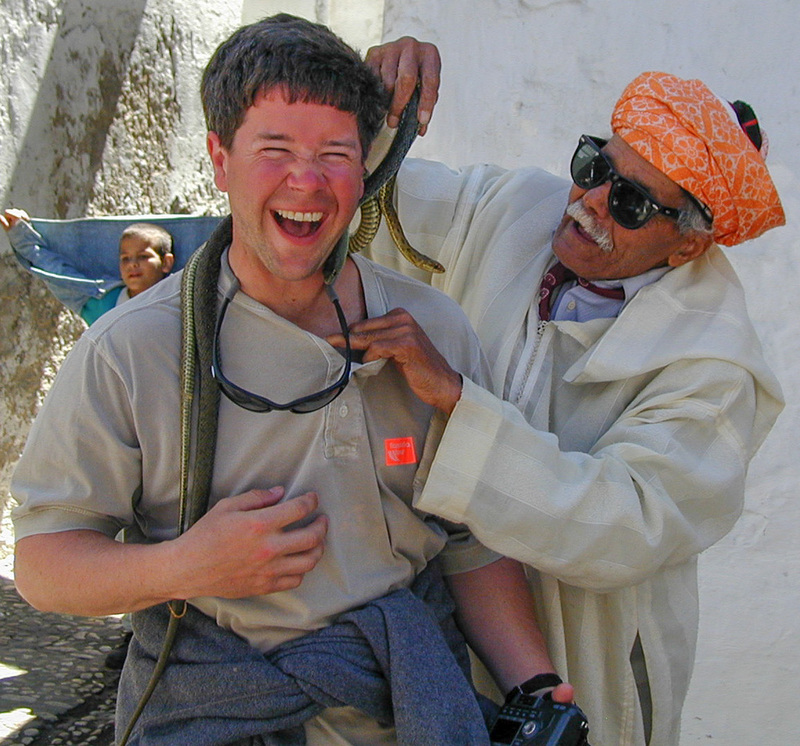 I think he expected to hold a snake, and was surprised when the snake-charmer slid a snake down Scott’s shirt. I was hoping we were not making our next stop at the hospital, but Scott, laughing uproariously, survived his snake interaction. As a joke, Scott told one of the street vendors that I needed a belt, even though I was still wearing my sweat pants from the camel experience. That vendor became my best friend and walked next to me through the market and square, attempting to get me to buy a belt. I was not interested and made that clear to the vendor. He did not respond well to the feedback, so I was glad when we got back in the bus. All in all, a lively, eventful, colorful and enjoyable trip to Morocco. An excellent adventure after days at sea. This entry was posted in Travel and tagged Morocco, Scott, Snake, Travel. Bookmark the permalink.